Dry skin, itching, red skin, sun burns, skin rashes are some of the most common skin problems that affect any age group. 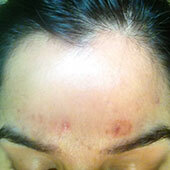 Various external and internal factors, inevitable in modern life, such as climate change, genetic condition, nutritional deficiencies, chemicals, bacteria, sun rays, air pollution, insect bites, wind, cold, cosmetics and highly alkaline soaps are some of the causes of these types of skin problems. Padanjali Ayurvedics, an Ayurvedic skin treatment centre provides specialized skin treatment solution for dry skin, sun burn treatment, treatment for skin rashes, treatment for itching, diabetic foot ulcers treatment, chicken pox scars treatment etc. Treatment for any kind of skin problems at our centre starts after the initial consultation with the doctor. The doctor decides the duration of treatment and usage of medicine after a careful analysis of your health, cause, nature and severity of the skin problem. Itching is a common sensation caused in the body due to a number of reasons. Sometimes itching occurs as a symptom of various skin diseases such as ringworm, eczema, allergies etc. In such case the irritation increases and the itching may lead to bleeding, pus formation and other skin complications. According to Ayurveda human body is analyzed with three doshas-Vata, Pitta and Kapha. Itching is associated with Vata Dosha (air), which regulates all activities in the body such as respiration, circulation and so on. This dosha is in fact getting aggravated due to various external and internal factors such as seasonal changes, pollution, bacteria, impurities in the blood etc. It’s a quite common that itching is more severe in the winter time than in other seasons. So, itching is a skin disease that requires high care and treatment to stop it going into further skin complications. Padanjali Ayurvedics offers natural treatment for itching skin using herbal medicines and ointments that makes no side-effects after the treatment. The treatment for itching skin at Padanjali starts after the initial consultation with the doctor. To start your treatment, contact our doctor through telephone or by mail with complete details of your skin problem. The doctor in the beginning analyses the cause and nature of itching and decides the duration of treatment and usage of medicines. To get a complete healing from itching requires certain precautions before and during the period of medication. Consult with our doctor and start your treatment. Sunburn is actually a condition of inflammation of the skin caused by ultraviolet rays due to prolonged exposure of the skin to the sun especially in summer. Padanjali Ayurvedics provides natural sunburn treatment and remedies to prevent sunburn. You can start treatment for sunburn after the initial consultation with our doctor. Contact our doctor through telephone or by mail for more information. Chickenpox is a viral disease that makes rashes and intense itching sensation all over the body. As the patient scratches, the rashes become blister which burst open causing open sores. The sores dry up in a couple of weeks leaving chickenpox scars behind it. Chickenpox scar looks ugly and it affects the confidence and appearance of a person. 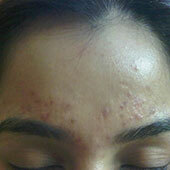 It is necessary to take further treatments for removing chickenpox scars completely from the skin. Padanjali Ayurvedics offers natural chicken pox scar removal treatments to take away chickenpox scars and black spots from your skin. 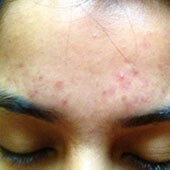 Starting chicken pox scars treatment at Padanjali Ayurvedics is very easy. The treatment for chicken pox scar removal normally starts after the initial consultation with our doctor. Our doctor will analyze your scars and other features of your skin to offer the best treatment for you. The duration of treatment and usage of medicines will be fixed after the initial analysis of your chickenpox scars. You can contact our doctor either through telephone or by mail with the complete description and snapshots of the chicken pox scars. Consult with our doctor to remove uneven chicken pox scars totally from your skin. Diabetic foot ulcer is an open wound at the bottom of foot commonly finds in 15% of diabetes patients. People with diabetes especially patients using insulin should be very careful as they are at higher risk of the formation of foot ulcers. There are number reasons for developing diabetes foot ulcers such as foot deformities, irritation, bad blood circulation, duration of diabetes etc. If diabetic foot ulcer left untreated it could become grave and lead to the amputation of the limb. Padanjali Ayrvedics provides natural diabetic foot ulcer treatment for people suffering from diabetes foot ulcers. Our diabetes foot ulcer treatment primarily focuses on the real cause. Treatment of diabetes foot ulcer at Padanjali Ayurvedics starts after the initial consultation with the doctor. You can contact our doctor through telephone or by mail. The doctor initially analyses the cause, nature and maturity of foot ulcer and prescribes effective diabetic foot ulcer treatment based on hypothesis. Consult with the doctor for more information. Skin rash is a common skin disease affected by almost all people at some part of their life. Generally the term skin rashes refers to a number of skin diseases like color changes of skin, group of spots on epidermis, skin inflammation, pityriasis rosea , hives, pimples etc. Skin rashes occur due to various reasons and in most cases infections, infestations, insect bites, allergies, ringworm, acne, psoriasis, chickenpox and shingles cause rashes on the skin. Padanjali Ayurvedics offer specific treatments for skin rashes for infants, teens and elders using herbal medicines. As the word skin rashes used for a number of skin diseases, it is very important to diagnose the cause of rashes on your skin before starting the treatment. Starting treatment for skin rashes at Padanjali Ayurvedics is very easy. The treatment can start after the initial consultation with our doctor. You can contact our doctor through telephone or by mail for consultation. The doctor at first analyses the cause, nature and maturity of your skin rash and prescribes effective treatment for skin rashes.